There can be no denying that Zambia’s Judicial system, especially the Constitutional Court, is in a crisis. It has failed to play its constitutional role. I would agree with Professor Hansugule’s assessment that the Zambian Constitutional Court displays unbelievable mediocrity and is an embarrassment to Africa and the rest of the world. In this article I argue that the September 5 decision of Justices Sitali, Mulonda and Mulenga to overturn a decision of the full bench was illegal, irregular and unprofessional and has no legal effect. It must pass as the worst spectacle of judicial rascality anywhere in the world. This is so because the lack of integrity or even active corruption within institutions mandated to enforce and safeguard the rule of law is particularly alarming and destructive to society. The social effects of such fact based and perceived systemic bias and corruption undermines the legitimacy of the state and democracy itself. The Constitutional Court’s “Judgment” delivered by Justices Mulonda, Sitali and Mulenga, on Monday September 5, 2016 has completely undermined the integrity of the Court, exposed some of its judges as either incompetent or partial or both. The petition was the opportunity for the court to show its authority in a contest dogged by institutional collapse and growing executive impunity regrettably the opportunity was squandered. Interestingly, from the judgement of the majority and of the two dissenting judges (Justice Munalula and Chibomba); we learn that a unanimous decision of the full Court announced on Friday September 2 at 11: 45 pm which ruled that a four day hearing in the petition was to start on Monday 5, September 2016 was overturned. In the Friday decision, the petitioners were allocated two days to present their case and the respondents two days to respond. On September 5, when the Court met to begin trial three judges (Mulonda, Mulenga and Sitali) issued a ruling dismissing the petition on the grounds that 14 days within which a presidential petition must be heard had expired. The lawyers of the respondent were not in court arguing that they did not want to participate in an illegality. It is quite intriguing that lawyers for the respondent can have the effrontery to say they will not appear before a court because to them the case appears illegal. One critical question which jumps out immediately would be – since when do lawyers appearing before a court decide the illegality of an act? Is it not a hallowed judicial function as to the determination of the legality or illegality of cases before a Court? One would have thought that even in matters that touch on jurisdiction it is the duty of the Court to say it has jurisdiction or otherwise. However, in this case, the respondents absented themselves from court without any application being made to the court and therefore without permission. In so doing they did not only demean the Court, they defiled the collective rights of the Zambian people which the Court represents. It was therefore unfortunate that the three judges who hacked the petition death unwittingly endorsed the Respondents contemptuous behavior. It appears from the judgment of the dissenting judges that the two dissenting judges had very little time to read the so called judgment of the three. This raises the following very serious questions: When did the Judges’ conference to arrive at a new decision take place? Who called this meeting and in what context? How do three judges overrule a full bench properly constituted at what is clearly an irregular meeting? Who re-opened the issue? When was the application for reopening made and to whom and where? Was the application to reconsider the Friday ruling made to the full bench? When was the application heard? The only logical conclusion is that the three judges (Mulonda, Mulenga and Sitali) caucused on their own over the weekend and decided to overrule the subsisting ruling of the full bench. They made the decision and wrote the judgment without any submissions from the parties. If this is not a conduct that subverts the judicial system; what is it? If this is not evidence of judicial brigandage, what is it? If this is not evidence of rascality and judicial fraud what is it? (1) First the meeting of the three judges that produced the ruling was irregular. It cannot be justified under any tenet of law known to the Zambian Legal system or perceivable in any part of the Common Law Legal Tradition. There was no motion filed or agued to revisit the issue. So there was no rehearing and parties did not have the opportunity of contesting the review of the ruling. Moreover the petitioners had relied on it and if judicial rulings turn out suddenly to be unreliable that is the end of democracy. It was not an open process and was not a full bench meeting. A small group cannot form itself out of the whole and overrule the whole. In addition, there were no new facts to consider. Courts do not reconsider rulings on rehashed arguments. The attempt to overrule the Friday ruling of the full bench is a subversion of the judicial system which calls into question the fitness of the three judges to hold judicial office. The three judges need to be given the Commonwealth Bangalore Principles on Judicial Conduct to read. In a truly democratic and functioning society, the three judges would be at this time facing the prospect of impeachment proceedings. (2) The remedy the three judges purported to give is not provided for in the constitution. Article 103 (3) provides that “the Constitutional Court may, after hearing an election petition-(a) declare the election of the President-elect valid; or (b) nullify the election of the president-elect and Vice President. The three judges’ purported to dismiss the petition a remedy not provided for in the constitution. Obviously in their reckless speed and effort to perfect their deed they failed to read the law as it is. It must therefore fail because a court of law cannot give a remedy not provided in law. Their purported judgement is therefore standing on nothing and the law is trite that you cannot put something on nothing and expect it to stand, it must surely collapse. (3) On the question of the 14 day period, Article 103 (2) provides that “The Constitutional Court shall hear an election petition relating to the President-elect within fourteen days of the filing of the petition.” There is no consequence provided for exceeding 14 days. Besides the section talks about “hearing.” It nowhere mentions “determining.” The article seems to have been drafted along the lines of a similar provision in the 2010 Kenyan Constitution. In marked contrast, the Kenyan provision talks about “hearing” and “determining”. Article 140 (1) of the 2010 of the Kenyan Constitution provides that: “(a) A person may file a petition in the Supreme Court to challenge the election of the President elect within seven days after the date of the declaration of the results of the presidential election; (b) Within fourteen days after the filing of the petition, under clause (1) the Supreme Court shall hear and determine the petition and its decision shall be final”. Judicial powers ought to be exercised judicially and judiciously – essentially it must be exercised in the interest of substantial justice and not to defeat the commonweal of the people. In this case, what we have seen can be called any other thing but never a judicious exercise of judicial powers. (5) As the Philippines Court of Appeal put it: “technicalities, however, must be avoided. The law abhors technicalities that impede the cause of justice. The Court’s primary duty is to render or dispense justice. “A litigation is not a game of technicalities” Law suits, unlike duels, are not to be won by a rapier’s thrust.’ Technicality when it deserts its proper office as an aid to justice and becomes its greatest hindrance and chief enemy, deserves scant consideration from courts. Litigations must be decided on their merits and not on technicality. Every party or litigant must be afforded the amplest opportunity for the proper and just determination of a matter before the court. If technicalities were to be the essence as opposed to justice what will societies be “but organized armed banditry”? It is quite clear that the legal reasoning of the three judges is flawed. It defies case law from around the world. The petitioners have been denied their panoply of due process rights guaranteed under the Zambia constitution –the right to be heard by an impartial tribunal. The technical argument is used as an excuse and does not appear to be the real reason for the conduct of Justices Mulonda, Mulenha and Sitali. There are many facts which suggest that there were other factors at work. Judges were receiving death threats and being threatened by leading Government officials and party officials. At no time did the court complain about this nor did the Attorney General as leader of the Bar seek to protect the judiciary from harassment. It is interesting that the same judges are not in a hurry to rule on the petition by the petitioners pursuant to 104 (3) which asked the Court to order in line with the constitution that the Speaker of the National Assembly act as president during the duration of the election petition. Article 104 (3) clearly states that: “Where an election petition is filed against the incumbent, under Article 103 (1), or an election is nullified, under Article 103 (3) (b) the Speaker shall perform the executive functions, except the power to- (a) make appointment; or (b) dissolve the National Assembly. Here we see no weekend meetings by the three judges to rule on this application. Lungu ignored this provision of the constitution with impunity and the court connived and condoned the impunity. While the behavior of the lawyers must always be respectful to the court and the court is right to admonish the petitioners’ lawyers for any misconduct they might have engaged in, it is inconsistent and a show of partiality of the three judges to fail to criticize the behavior the respondent’s lawyers for failing to turn up for court on September 5. (Unless of course they had sought and got permission at the illegal weekend meeting that decided to overturn the majority verdict). A court that is impartial would have admonished both sides. The problem in Zambia is that the Judiciary branch of government is clearly beholden and subservient to the Executive branch. The courts are plagued by political influence and endemic corruption. The lack of clear separation between the judicial and executive branches of government has led to a harmful politicization of the judicial system. The lack of a transparent system for the appointment of judges and the concentration of the appointment system in the presidency has meant that appointments and promotions in the judiciary are based on political patronage rather than merit undermining both the professionalism and the independence of the institution. As Professor Hansungule and the Post News Papers have pointed out, even the Zimbabwean Courts have fared better. The Zimbabwe courts have ruled in favor of freedom of assembly, declared the offence of insulting the President unconstitutional and made many other admirable decisions on the rights of citizens. 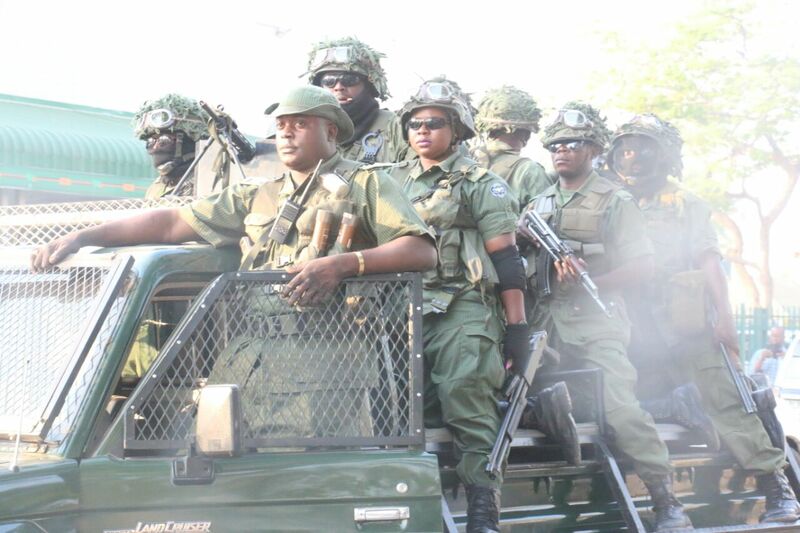 A sad development in Zambia is that those that wish to enforce their constitutional rights are victimized twice. They are called selfish and are labeled tribalists. A coterie of job seekers and their night pastors, priests and ex priests call on them to make peace for the sake of the country whatever peace means in this situation (maybe they are expected to accept the peace of the grave). In a strange twist of events, the victims become the villains when in fact it is despots who are the problem. What is at stake in Zambia is the capture of the state by a small connected group of people, the entrenchment of acolytes in top posts, the collapse of state institutions because of cronyism and the looting of resources for personal gain. This group is lawless and knows no boundaries. But the only reason for the triumph of evil is for good people to say nothing. By preventing Zambians and the world to hear and see the facts contained in the petition Justices Mulonda, Mulenga and Sitali have tried to legitimize the 2016 sham and massively rigged election and provide a veneer of legal authority and expertise to a fundamentally flawed electoral process. They tried to cover up the partisan and partial – some would say – near criminal) incompetence on the part of the Electoral Commission of Zambia whether in terms of pre-election arrangements for the poll or in the delivery of results. They protect and immunize the criminal behavior of top officials of the Electoral Commission.